275 Old Indian Head Rd. Welcome to SPORTIME! We offer 154 indoor and outdoor tennis courts, fitness clubs and sports arenas at 13 clubs across Long Island, in NYC, in Westchester and in the NY Capital Region. SPORTIME strives to provide its members with welcoming and comfortable environments and the best instructional programs anywhere. 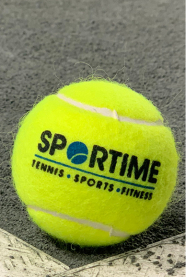 SPORTIME's "fitness for real life" philosophy is reflected in clubs that are state-of-the-art, yet affordable, and that offer the best tennis facilities and instruction, along with great gyms, camps and sports and fitness programs. SPORTIME is most proud to be the home of the John McEnroe Tennis Academy at Randall’s Island, NYC since 2010, and home of the JMTA Annexes at Syosset, Long Island, and Lake Isle, Eastchester, since 2012. Claude purchased his first tennis club in 1981 at the age of 19 and founded SPORTIME in 1994. He provides vision and leadership for all SPORTIME corporate directives. Claude supervises SPORTIME's Senior Leadership Team and manages the relationships with SPORTIME's Partners and funding sources. A member of the Bar in New York and Washington DC, Ben is the Managing Director of SPORTIME's flagship NYC location and of the John McEnroe Tennis Academy. Ben is also SPORTIME's Chief Legal Officer, functioning as house counsel for matters including acquisitions, contracts, insurance, employment, and immigration. He assists the CEO with SPORTIME's Partner and lender relationships. Ben also manages SPORTIME's construction and capital projects, with the assistance of the Company's Engineering Department. He is a member of SPORTIME's Senior Leadership Team. Jeff develops and implements the Company's operations policies, objectives and initiatives and provides essential support to site leaders. He coordinates the budgeting process with SPORTIME's CFO, including proforma budgeting projections for new sites. Jeff works closely with the CEO and with Senior Leaders to facilitate the Company's success. He is a member of the Senior Leadership Team. With Claude, Dan is a founding Executive/Partner of SPORTIME. With 30 years experience in tennis court and enclosure construction, Dan is in charge of the maintenance and improvement of our facilities. In addition to supervising SPORTIME's Engineering Department, Dan works with site Leaders to help train and supervise site housekeeping and maintenance staffs. He is a Member of Senior Leadership Team. A Certified Public Accountant with more than 20 years experience, Laurie supervises SPORTIME's Accounting Department. Laurie coordinates the Company's budgeting processes with SPORTIME's CAO, and manages SPORTIME's banking and lender relationships with the CEO and CLO. She is a Member of the Senior Leadership Team. Currently General Manager of SPORTIME's Syosset and Bethpage Tennis sites, Joe created SPORTIME's successful Start Kids multi-sport curriculum and SPORTIME Volleyball Club, and currently supervises multi-sport programs at five SPORTIME locations, including SPORTIME's 56,000 square foot multi-sport club in Bethpage where he is the Senior Leader. Joe also provides senior leadership to all SPORTIME multi-sport summer camps, currently offered at five SPORTIME sites. Kelly has over 25 years of experience in marketing, communications, design, production, project management and, recently, in web and app development. Kelly manages all global marketing efforts for SPORTIME and for the John McEnroe Tennis Academy, and she coordinates central office procedures as they relate to customer communications and outreach. Dani’s career includes over 15 years in human resources and operations. She holds an MBA and is SPHR and SHRM-SCP certified. She manages all SPORTIME human resources functions and welcomes all of your questions and feedback. Responsible for SPORTIME's information and technology infrastructure and services, including computers, phones, internet, and the SPORTIME member database, as well as related hardware. Lawrence became the Director of the John McEnroe Tennis Academy in the summer of 2012. Lawrence is a key member of the team that coordinates tennis pro hiring for the company and he is SPORTIME’s tournament and elite junior training expert. Lawrence has coached/coaches numerous sectionally, nationally and world ranked junior players, including 2014 Wimbledon Junior and US National Boys 18 Champion, Noah Rubin. Lawrence has coached since Noah was 7 years old.